St Brigid anemones are the double petalled form of the standard De Caen anemones. An excellent mixture of pink, white, red, blue and bi-colours. For best germination, plant in seed trays first and keep in a cool location. Transplant carefully once they have a few cm of leaf growth. Do not over-water. 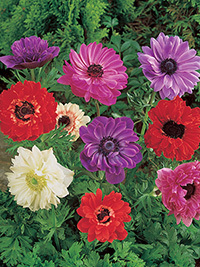 Anemones are cool climate bulbs and will not germinate well if planted directly into a warm sunny place.